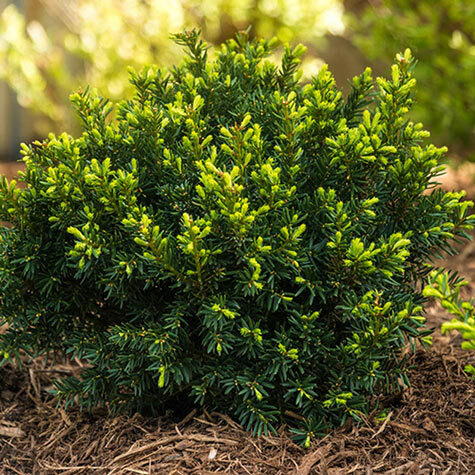 Low-growing, evergreen shrub with spreading habit makes an excellent foundation planting—and it's now available in a gallon pot and shipping now. 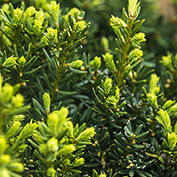 Growing 3-4 ft. tall with a 4-6 ft. spread, Dark Green Spreader Yew has soft, dark green needles and a dense habit, making it ideal for foundation plantings and rock gardens. Grows best when planted in well-drained soil in full sun to partial shade. Potted. Zones 4-7. 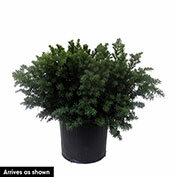 Comments: Very hardy, dense-growing evergreen displays attractive, soft, dark green needles year-round. 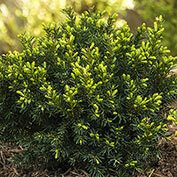 A small, low growing, spreading evergreen shrub. Makes an excellent foundation plant, ideal for use in rock gardens. Dark green needles add contrast and texture to the winter landscape.